44 pages plus covers, text, colour photographs, black and white archive photographs, colour profile art. Although the Wingnut Wings Gotha G.IV kit officially sold out in December 2016, interest in the subject has continued, so much so that this special on building the Gotha is now in its third printing. Originally published in 2011 following the December 2010 release of the Wingnuts Gotha kit, Windsock’s first WW1 modelling special was widely acclaimed and deservedly so, for being the ideal ‘special’ on how to make and detail this outstanding model. The unexpected reprinting of this title has fuelled speculation that Wingnuts may reissue the Gotha in a Duellist boxing. Time will tell…. 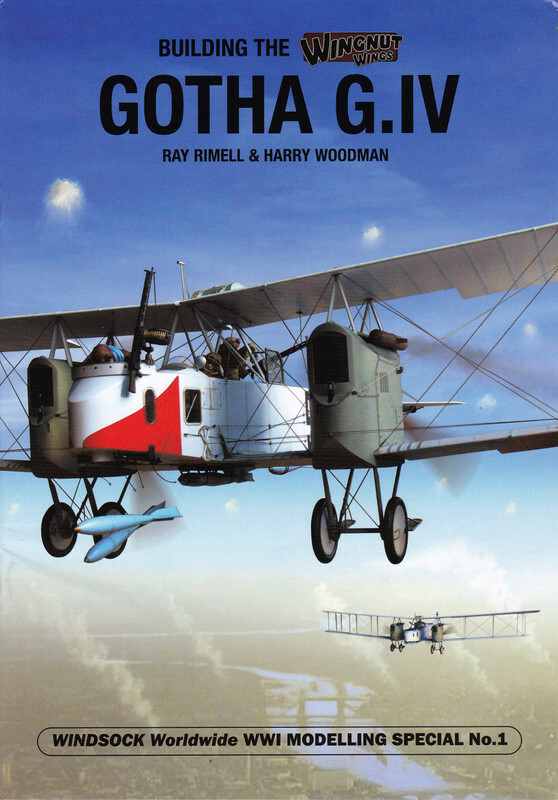 Ray Rimell’s Windsock stable has rightly become the default setting for quality assessments of the new Wingnut kits and since the Gotha, specials have also been published on making the Albatros D.V/ D.Va, Fokker D.VII, AEG G.IV, and most recently the Sopwith Camel ( Clerget) and LVG C.VI featured in the latest Duellist boxing. 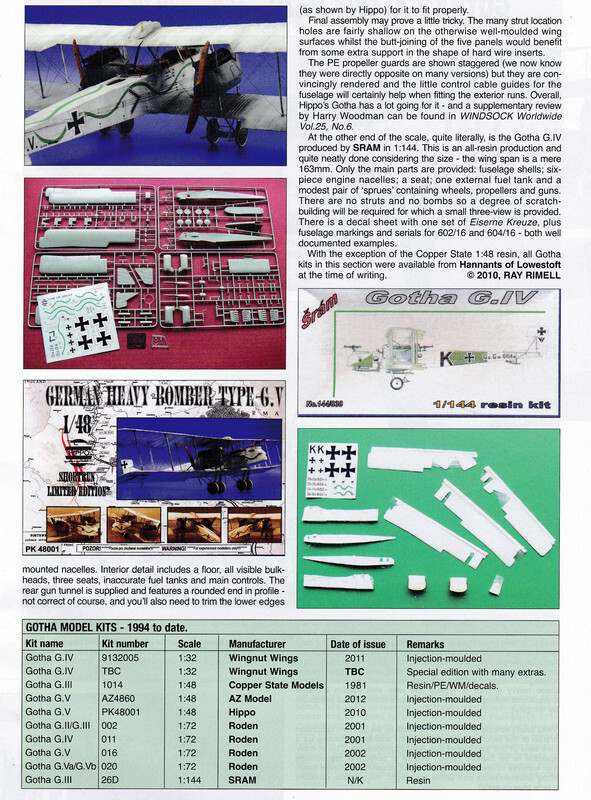 The Gotha Windsock Modelling “Special” is wholly focussed on the bomber and the 1/32 kit though there is also a two page section detailing other Gotha kits in assorted scales over the years. As always, Ray’s publication has an excellent variety of build and detail articles- copiously illustrated with colour photos, plus a nice blend of contemporary reference photos, delicious close-up images and all of it augmented with Ronny Bar Gotha profiles. The authors of this special are Ray Rimell and the late Harry Woodman. It’s a perfect blend of Ray’s extensive expertise augmented by Harry’s full history of the Gotha bomber featuring excellent photos and drawings which highlight armament, bombs and other features. A total of 232 Gotha G.IVs were built, although their numbers in front line service never exceeded a figure of 36 in June 1917. Ronny Bar’s centre-spread colour profiles bring the subject to life with two appealing schemes. The Special is profusely illustrated and features more than 270 colour photos, 36 archive images and eight sketches. This is a major plus as most modellers- especially this reviewer- find good illustrations a crucial help in following build logs or learning techniques. Special mention should be made of the striking cover- a blend of Ray’s model skills in a combat pose on a digital composite background by Jerry Boucher. This dramatically frames the publication and is a striking way to introduce the Special. 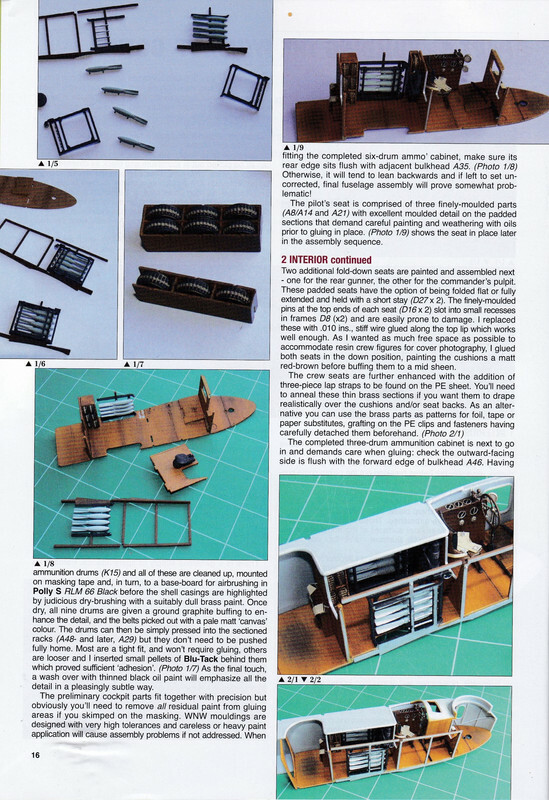 As well as an ‘in-box’ look at the Gotha kit, the author offers an in depth illustrated 20 page build log of the Gotha filled with added detail and tweaks. This, coupled with Wingnuts’ own instructions booklets give you all you need to know to produce a great Gotha. An assortment of various original black and white reference photos strategically placed throughout the pages contain some very valuable visual information for the modeller. The archive images clearly place the aircraft in their true historical context and are especially useful for depicting weathering and in-service “look”. There’s no question that these Specials on building Wingnut Wings models are invaluable, and we hope Ray Rimell will continue to give us Specials for the whole Wingnuts range. 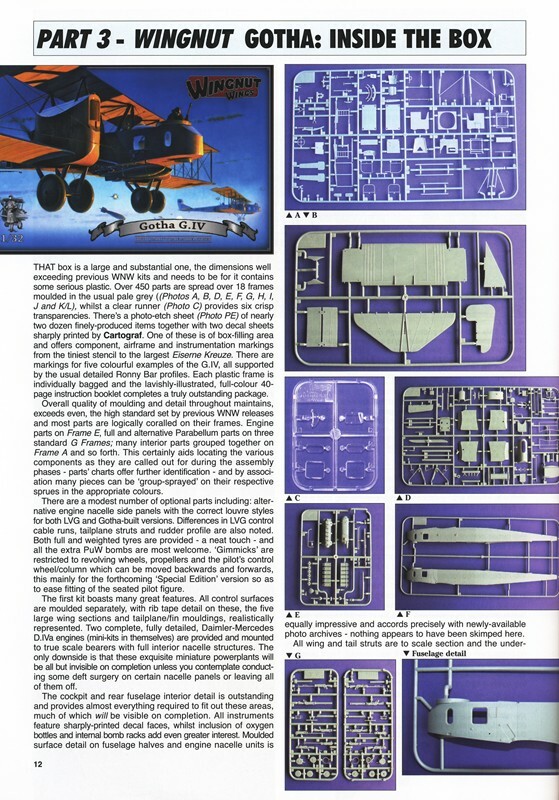 These and the Wingnuts instruction booklets give the modeller everything needed to get the most from their Gotha kit and incidentally would also benefit modellers working in other scales. Coupled with Wingnuts’ own excellent instruction booklet, this is an invaluable reference work in its own right, an essential “must have” for anyone making the Wingnuts Gotha G.IV. The best model reference work for these kits you are ever likely to see.